Let me start by saying that ALL students CAN have NEAT desks! Organization is LEARNED. If you teach your students good organizational habits, and hold them accountable for it, they can achieve this. I'm about to explain to you how I keep my students' desk from looking like this. One day, while walking around my classroom, I was horrified to see how many students had terrible, messy desks. They couldn't get a pencil out without ten things tumbling to the ground. Not only is this a bad habit, it was wasting precious instructional time every single day! I knew I had to do something. 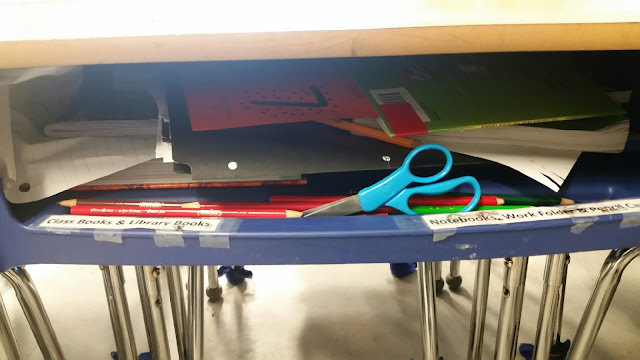 I had been telling my students to keep their supplies in their supply boxes or pencil pouches, their papers in their folders, and their books stacked neatly, but somehow it wasn't clicking. So, I YELLED, "RANDOM DESK CHECKS!" as loud as I could. It startled them! It startled me! "Everybody up! Push in your seats, and come stand at the back of the room on the tile floor!" The students had no idea what I was up to. I didn't really either. All I knew is I was going to make these kids clean their desks. They quietly shuffled to the back of the room, whispering and giggling with each other, trying to figure out what Mrs. Smith was up to. When I reached the first desk, I realized how serious the situation was. 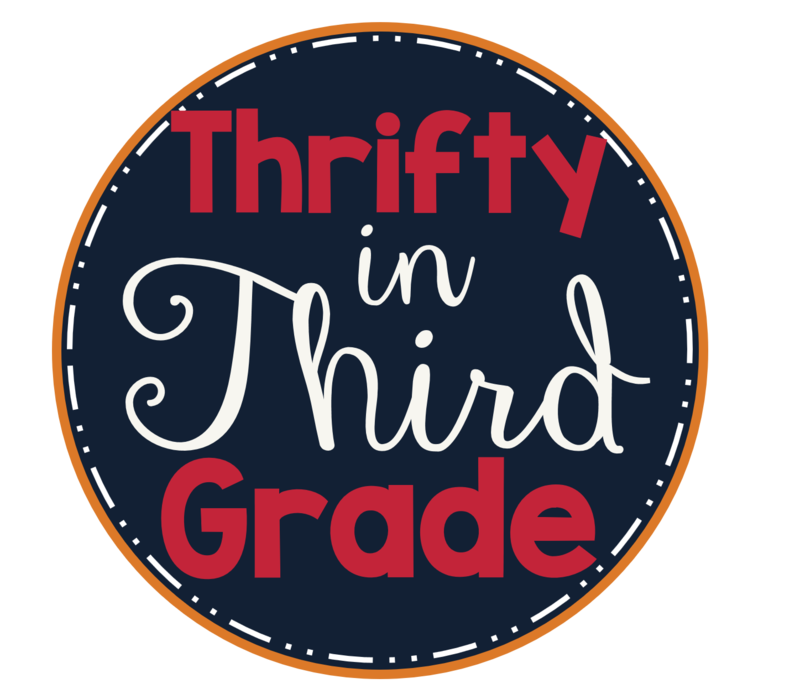 Crumpled up paper, secret stashes of candy and wrappers, crumbs, uncapped glue sticks, broken pencils, open books, sideways notebooks, a BANNED pencil sharpener, shavings, and some weird sticky stuff. It hadn't been my original plan to dump the desk. I had planned to pull some things out, set them on top of the desk, and call the student over to straighten it up. But when I saw how bad the desk was, it just had to be dumped. We had to start at square one. One by one I went to each student's desk and dumped them. They were atrocious! Only one student had a fabulous, neat, clean desk. (She was a mini me-type A, organized, neat freak!) I called the class over. "Let's take a look in this desk." They all came over and squatted down to look inside the desk. It was neat. The papers were all in the classwork folder. The books were stacked neatly. The notebooks were stacked neatly. The supplies were put away. There were no mysterious crumbs. No sticky stuff. No pencil shavings from a banned pencil sharpener. Everything had a place and was easily accessible. We had a class discussion. A heart to heart. We talked about why it was important to have neat desks. We talked about how much time we were wasting in class when we couldn't find things or stuff fell out of our desks. We talked about what we liked about that student's desk. I explained that from now on, we would have neat desks like this one. I would be having random desk checks and would be making sure they kept their areas neat and tidy. Then, the students went back to their desks and got organized. They found missing library books. They found old, gross, food wrappers. They threw away TONS of garbage. They were happily chatting away, excited to be organized. This surprised me the most! I was expecting attitudes or disgruntled students. I had, after all, dumped almost every desk. But instead, they couldn't wait to get organized! Students were buzzing with excitement. I decided to give the few students who hadn't had to have their desks dumped a trip to my prize box. The other students clapped for them! From that day forward, we had a new expectation in our classroom. Neat desks were expected! Later that day one of my students asked me if we could have a random desk check again. I laughed and explained that no, it isn't random if you ask me. Also, we had just cleaned our desks! This lasted for a week or two, and then I noticed a few students' desks starting to get sloppy again. I casually mentioned this to the class in my most secret, dramatic, HINT HINT, voice! "I am noticing some messy desks again! Hmm, that reminds me about something I need to do!" The students started whispering, "random desk check", to each other. The messy desk students quickly straightened up. We went on with our lesson. Later that day I yelled out, "RANDOM DESK CHECK" again! The students giggled and ran to the stand on the tile in the back of the room. I, very dramatically, rubbed my hands together like I couldn't wait to dump some desks. I walked from desk to desk, peeking inside. The students were holding their breath, about to burst with excitement. When the desk wasn't messy, I acted disappointed. (Secretly, I was THRILLED this was working!) No desks needed to be dumped that day. The class was so excited. Everyone went to the prize box. We spent a little extra time at recess as a reward. Now, my students take pride in having a neat, organized desk. They tell me all the time how nice it is to have everything in order. They are happier. I compliment them all the time at how much progress they have made. And occasionally, I yell out "RANDOM DESK CHECK" and dump a few desks. Students are never embarrassed when they get their desk dumped. Most of the time they are relieved because they know they need to get it together again. Their neighbors help them. They share ideas of the best way to fit things in. It really has made such a difference. They beg me for random desk checks. Now I carry this same tradition on with each class I teach. The first Random Desk Check is always shocking and exciting and FUNNY. After that, students work really hard to have a neat desk. It is always one of their favorite memories from the school year. I have received notes from my students, thanking me for helping them learn to be organized. It has saved so much instructional time. I couldn't believe how something so silly and dramatic worked! It was like magic! I hope it can work in your classroom too! Great blog! Yes, messy desks drive me crazy too. I need to remember to do this. Thanks for the idea.